The word Coelacanth is an adaptation of the Modern Latin Cœlacanthus ("hollow spine"), from the Greek κοῖλ-ος (koilos "hollow" + ἄκανθ-α akantha "spine"). It is a common name for the oldest living line of Sarcopterygii, referring to the hollow caudal fin rays of the first fossil specimen described and named by Louis Agassiz in 1839. 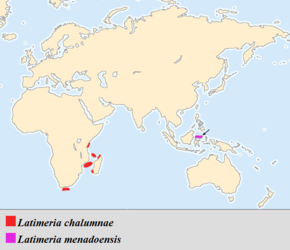 The genus name Latimeria commemorates Marjorie Courtenay-Latimer who discovered the first specimen in a fish market.